Southern Equine Veterinary Services is a family-owned veterinarian services company, specializing in equine care throughout Kentucky. We deliver a tailored, compassionate approach to caring for your animals, from preventative medicine to emergency care and beyond. We’re available 24/7 for emergency services! Not just any vet can attend to the needs of horses—it takes a classically trained equine veterinarian in KY to ensure these animals are getting the high level of care they need when it comes to both preventative care and emergency treatments. At Southern Equine Veterinary Services, we’ve devoted our practice to caring for horses and have amassed an unparalleled level of knowledge and expertise when it comes to all facets of horse health and wellness. At every stage of your horse’s life, no matter its health or condition, no matter its breed or purpose, know that we pride ourselves in administering the highest levels of personalized attention. More than a large animal vet in KY, Southern Equine Veterinary Services is able to offer equine services that are critical to the long-term health of your horse. 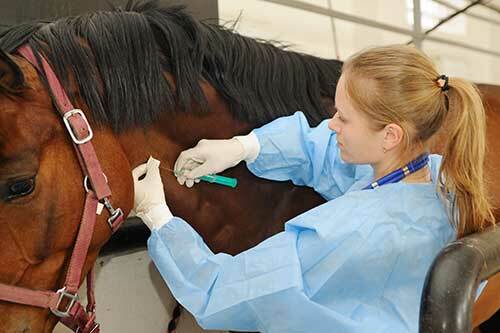 Call on us for everything from wellness care and advanced equine dentistry, to pre-purchase exams, lameness evaluations, horse reproduction services and more. We even offer radiological imaging, ultrasounds and StableLab testing! Whether it’s time for a checkup and routine examination, your animal is showing signs of illness, or you’re seeking the expertise of an equine reproductive expert, know that you and your horse are in good hands with Southern Equine Veterinary Services. We’re members of the American Veterinary Medical Association (AVMA). We’re members of the American Association of Equine Practitioners (AAEP). Owner DeAnn Hughes is a licensed Doctor of Veterinary Medicine (DVM). We accept CareCredit and various other forms of payment for your convenience. We’re on call 24-hours a day for horse emergencies. If your horse requires veterinary services, performed by a licensed professional, contact us today. We’re available 24/7 for emergencies and by appointment for general checkups and procedures.